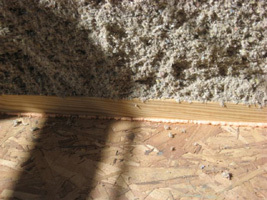 Wall construction type can generally be described as having 2x6 wood stud walls 24" on-center, filled with wet cellulose and then covered with 2" thick rigid foam. 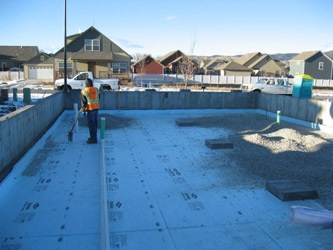 This construction approach for walls was compared by Building Science Corp. with other advanced wall construction types, and this approach was tied with two other approaches for the best wall design based on five, equally rated criteria: thermal control, durability, build-ability, cost, and material use (Building Science Wall Discussion). 3' high crawl space walls below the rim joists insulated on the inside with RUS = 19 fiberglass bats (continuous), and extending out on crawl space floor 1'. 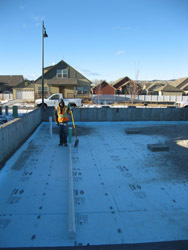 Crawl space walls extend 6" above ground level on the outside, with the remainder 2.5' below ground. 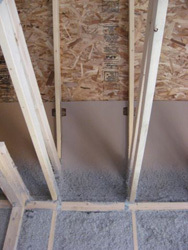 The use of fiberglass batts on crawl space walls can lead to moisture problems, and is not recommended by Building Science Corp., Building Science report on high-R value foundations although the REL is located in a high mountain desert with very low humidities. 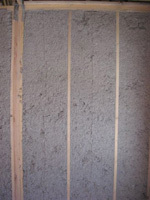 2" thick x 8" high XPS rigid foam on inside footings with RUS = 10. 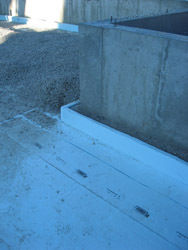 Gravel was filled in for the crawl space floor to the top of the rigid foam. 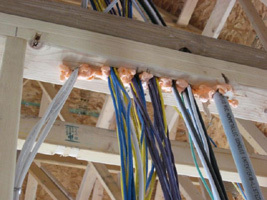 The RUS = 19 fiberglass bats mentioned above overlap this rigid foam since the batts extend out onto the crawl space floor. Triple-pane, low-emissivity windows with high solar gain (SHGC = 0.49, with thermal conductivity UUS = 0.31) on south, west, and some of the east side, and low solar gain (SHGC = 0.28, with UUS = 0.29) on north and some of east side. These thermal conductivities correspond to thermal resistance values for the high solar gain windows of RUS = 3.2, and for the low solar gain of RUS = 3.4. 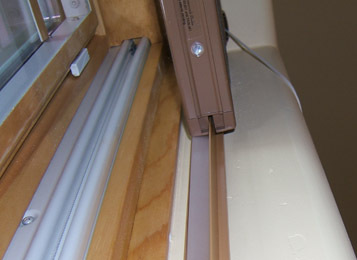 Double-cell cellular shades (most "room darkening" with foil liners) with side seals for all windows, and all are closed at night, with thermal resistance measured to be about RUS = 2.0 for the room darkening shades and RUS = 1.2 for the light-filtering shades. Thus, the combined window and shade R-value (night-time only) for the high solar gain windows and room darkening shades is RUS = 5.2, and for the low solar gain windows is RUS = 5.4. 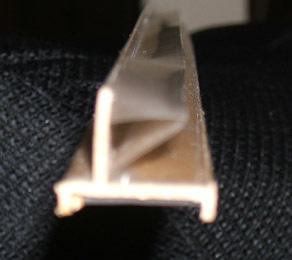 The air flow sealing at the sides of the shades is accomplished using a labyrinth-type seal as shown in the left hand figure below. This image is looking almost vertically upward from the bottom of the window. An end view of the penetrating piece that has been removed from the side of the window is shown in the right hand figure below. The Z-shaped piece of flexible plastic seals against the inner set of cells in the cellular shade. Two doors to the outside, with storm doors, one combination estimated to be USI = 0.35 (RUS = 2.9), and the other to be USI = 0.30 (RUS = 3.3). High-efficiency (97.5%), natural gas fired, modulating, condensing furnace with ECM fan motor. The maximum firing rate is 60,000 Btu/h. "Modulating" means that the furnace first fires at 70% of the full rate for 30 to 45 s. Then it reduces to the minimum firing rate of 35%. The firing rate is automatically adjusted to meet demand, increasing gradually to maximum firing rate (100%) if the thermostat is not satisfied within a defined time. Natural-gas fired, 20,000 Btu/h input, direct-vent fireplace. "Direct-vent" means that the combustion system is sealed, with combustion air coming from the outside, and combustion products vented to the outside. 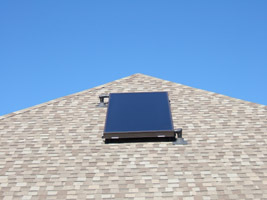 Small solar hot water preheater with 25 ft2 absorber area mounted at 36.9° tilt angle from horizontal compared to latitude of 38.6°, 50-gallon stainless steel solar storage tank, followed by natural-gas fired tankless water heater with variable input firing range from 11,000 to 199,000 Btu/h..
Ceiling Height - The ceilings are 9 ft. high throughout the house, with no cathedral or raised ceilings. Summer Cooling - The house is located in a high mountain valley in Colorado at about 7100' elevation. It has Energy Star rated ceiling fans in every room, but no air conditioning. July has the highest average temperatures, with an average daily high of 83°F, and an average daily low of 48°F. By opening the windows at night and the closing the windows in the morning, cool air is sealed inside the house, and the house remains comfortable during the day. The highest temperature inside the house observed during the past summer was about 76°F or 77°F. Thirteen of the windows have rough openings of 41" x 59", and all of these are filled with double-hung, triple-pane windows. 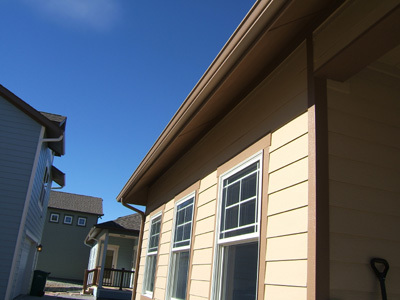 There is also a double-hung, triple-pane window with a rough opening of 36" x 36". Finally, there is a fixed triple-pane window in a rough opening 48" x 48". There are four of the 41" x 59" windows on the north side, and all are low solar gain (SHGC = 0.28, with UUS = 0.29). Three more of these 41" x 59" windows are located on the east side, two with low SHGC, and one with high solar gain (SHGC = 0.49, UUS = 0.31). The one 36" x 36" window is also on the east side, and it is high solar gain. There are four of the 41: x 59" windows on the south side, with three shaded by the 24" roof overhang, while one is on a porch that, combined with the roof overhang, gives a total overhang of 8.6'. 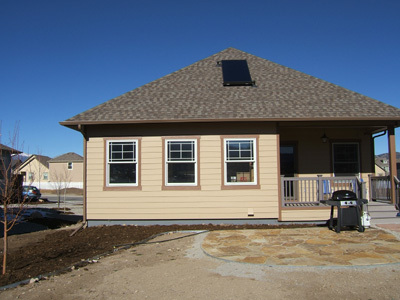 (One of these was an "extra" window beyond the standard floor plan added to take advantage of the high solar insolation available in this area.) On the south side, there is also a "full-lite" door with double-pane windows with the glass measuring 21" wide and 5.24' tall, and a full-lite storm storm with a single-pane glass window that overlaps the window in the main door. The SHGC for the combination is estimated to be 0.25, and USI is estimated at 0.30. Finally on the west side are two of the 41" x 59" windows, both with high solar gain, and the 48" x 48" fixed window with high solar gain. Solar Domestic Hot Water System - Using a tankless water heater downstream of the solar storage tank allows the solar hot water pumps to operate any time that the solar thermal panels are significantly hotter than the water in the storage tank. If the solar storage tank were heated using auxiliary heat to a delivery temperature of approximately 125°F, then the solar hot water pumps would only run when the solar thermal panels were in excess of the 125°F. Using the separate solar storage tank upstream of the tankless heater allows the solar collectors to operate more often and at higher efficiency, since the collection efficiency drops with increasing water-inlet temperatures. 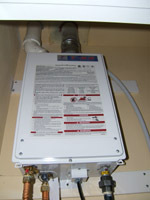 A disadvantage of this approach is that at low hot water flows, the tankless water heater apparently cannot run at low enough heat input, so it does not turn on, and the delivered water is colder than desired.